With the product development phase of the Sutrue devices close to competition, in Q4 2018, our Managing Director, Stephen Squire, is leading the next phase of the road to market for our revolutionary devices. As with all medical devices, the Sutrue devices need to be put through rigorous medical evaluation and testing, so Stephen has utilised the signposting service at the National Institute for Health Research (NIHR) to begin this process. Sutrue has started to build relationships with NHS Trusts with the aim of establishing suitable partners interested in testing the automated suturing devices. The NIHR operates twenty Biomedical Research Centers in the UK, and we are extremely pleased that so far four of them have expressed an interest in partnering with us to pilot both the Handheld and Robotic devices. All the institutes who have approached us have an interest in developing specialist surgical techniques. This incredibly positive market response is double the level we were led to expect and reinforces the strong need for the Sutrue devices in the medical industry. We are currently in the process of establishing the most suitable partner to carry out the clinical tests and evaluations. Furthermore, in order to achieve our forecast revenue, Sutrue only requires two NHS Trusts to procure the Sutrue devices by the end of the third year of sales, so it’s incredibly encouraging that there is already twice as much interest from the medical market. Our market penetration expectations look set to be exceeded early, validating the market demand for these intrinsically safe devices. The need for the Sutrue devices in the veterinary market is also being explored through discussions with vets and the building of a relationship with a large veterinary distributor who is very interested in the potential of the Sutrue Handheld device. As devices used by vets require significantly less testing, the roadmap to commercialisation in this market is far shorter, with our first case studies expected to be completed within 2019. Investors’ funds will help us to revolutionise the process of medical stitches into a faster, safer and more accurate automated process, which will significantly benefit patients, surgeons, healthcare workers, healthcare institutions and vets throughout the world. Sutrue were delighted to present our range of automated suturing devices at the prestigious IDTECHEX event, Santa Clara Convention Centre on Wednesday 14th and Thursday 15th November. It was an absolute privilege to exhibit at the conference and we were fortunate to have been allocated one of the best spots in the show, a demonstration area by the main entrance. Our location was perfect for engaging with the 3,500 guests as they entered the show! The image above shows Alex and Bob (the Sutrue dummy) ready to meet attendees. We were overwhelmed with the positive feedback we received from the range of high-profile attendees who came to our stand. After watching a brief brand video, visitors were quick to grasp the importance of our devices, the need for innovation in the market and the range of potential applications. Many offered to connect us to relevant companies and contacts in their network to help us get our devices through the next steps in our road map – fundraising for the regulation process, manufacturing, then out to market. Following on from the enthusiastic reception, we even managed to squeeze in some last-minute meetings, the outcome from which we hope will have some very positive and far reaching implications. 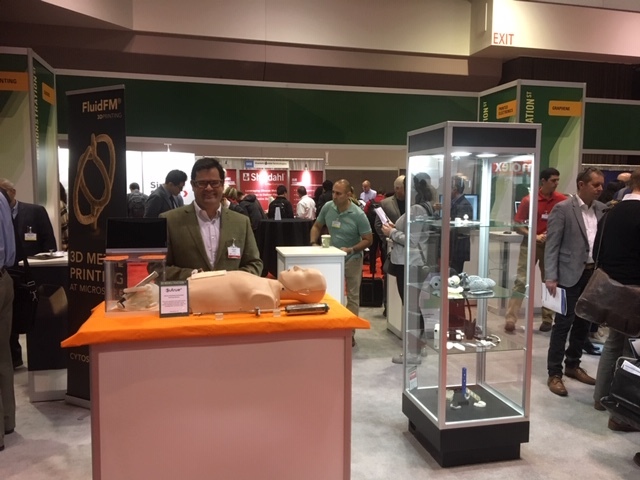 In addition to exhibiting, Sutrue presented our automated suturing devices during a 20-minute talk on Thursday 15th in Ballroom D. Sutrue were in good company, with fellow presenters including Microsoft, Sony Corporation, GE Global Research, Porsche, Toyota and BASF to name just a few. Our talk was entitled ‘Rapid Prototyping: How using 3D Printing and ‘Multi-Typing’ can reduce costs, time and waste when engineering medical device prototypes’ and aimed to share our experience in designing using 3D printing. If you follow this link you can download presentations from the talks (registration with IDTECHEX needed). All in all, we had a fantastic conference, enjoyed the general friendliness of the Californians and made some excellent connections for the future road-map of our device! 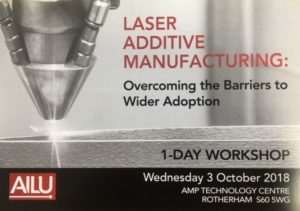 On 3rd October 2018, the Association of Industrial Laser Users hosted a one-day workshop at the TWI Technology Centre entitled ‘Laser Additive Manufacturing – Overcoming Barriers to Wider Adoption’. This was a poignant workshop topic due to the increasing emergence of additive manufacturing within mainstream manufacturing and the barriers to entry that also present themselves. Subjects covered at the workshop included issues around processes, hardware, software, materials, modelling, certification and testing. Sutrue recently joined as an AILU member and were honoured to be invited to present at the event. Our talk was based around medical device prototyping and explored the topic of when additive manufacturing (AM) is the best approach to take, as opposed to mass manufacturing. We began our talk with a brief introduction to the Sutrue brand and team, moving on to the device components and how they have been made with additive manufacturing in mind. 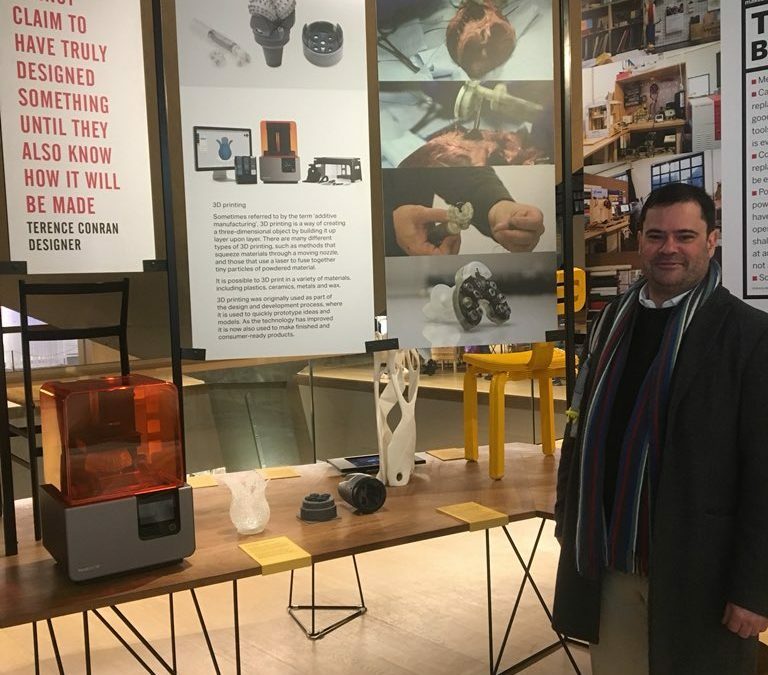 We then covered the patent of the devices and the industry applications, before moving on to answer the key question – when additive manufacturing is best utilised. After the presentation, the Sutrue team was pleased to receive a lot of very positive feedback from the audience, in addition to other speakers, about how positive it is to see additive manufacturing being used to create innovative and beneficial products of this nature. It was a privilege to present at this industry event alongside thought leaders from the University of Birmingham, Laser Additive Solutions, Croft AM, Oxmet, LPW Technology, TWI, Materialise, Sigma Labs, MTC, Lloyds Register, not to mention, major equipment suppliers such as Renishaw. Having successfully created two new automated suturing devices which are set to transform the suturing process and potentially save the NHS £10.7 million each year, we are keen to spread the word about our devices and are planning to host an exciting Press Announcement at the Design Museum, London, where our handheld device is currently exhibited. The press announcement is taking place on 30th May 2018 and the press that attend will be amongst the first people in the world to create automated robotic stitches using a Zeus medical robot and the Sutrue robotic suturing device. The event will also include an inspirational Q&A with a panel of thought leaders involved in the design, engineering, testing and patenting of the device. Attendees will witness the handheld suturing device in action and have the opportunity to compare it to traditional hand stitching. They will also have the chance to view the handheld device at the museum’s ‘Designer Maker User’ exhibition. There are still a few places left, so please contact Thea@sutrue.com if you would like to attend this ground-breaking event. The technique for producing medical stitches hasn’t changed since the times of Ancient Egypt – until now. Medical stitching by hand can be problematic as it relies on the ability, dexterity, training and alertness of the practitioner. We have solved this historic problem through the creation of two revolutionary automated stitching devices. They transform the manual process of stitching into a far simpler, quicker and more accurate automated process, thus reducing the margin for human error. There have been over 10,000 patent attempts to produce a device that sutures wounds and we are proud to be the first to successfully achieve it. To create our unique suturing mechanism, we produced 38 different prototypes and designed and tested over 1,500 parts, which involved 15,000 hours of design work. 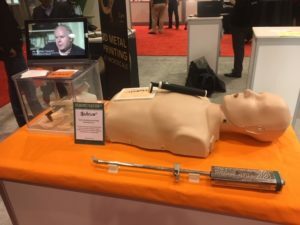 This resulted in the creation of a patented automated suturing mechanism that now consistently works across both types of devices – the handheld and the endoscopic/robotic. “It’s true to say that the majority of operations we’re doing today are still open and that’s not because the patient wants them open, it’s because of the limitations of the technology and so there are many improvements to technology that we need to get to the point where we can do everything as a keyhole operation and I see this [Sutrue device] as one of them”. “Rapid prototyping has significantly reduced the cost of the creation of the devices, probably by a factor of 50. It has also shaved years off the time it would have otherwise taken. We’ve taken a ‘create, print, test, tweak, reprint’ approach to solving the problem. We even coined our own term for the working process and called it ‘Multi-typing’, which is the ability to loosely design the same component in three or four different ways, have them printed within a few hours and then test and learn from each prototype. This approach has been instrumental in allowing a small start-up company likes ours to maximise our output in terms of creativity and problem solving”. Concept Laser – now a part of GE Additive – has been working with Sutrue for almost three years with the printing of the very small and detailed parts that the automated suturing devices require. 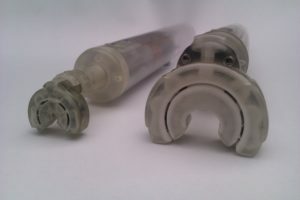 “By using the high-resolution capabilities of our Mlab cusing R 3D printer, Sutrue has been able to successfully speed up the engineering process involved in the creation of their medical devices, through a process called rapid prototyping,” (said Stephan Zeidler, business development manager for the medical sector at Concept Laser). “Once designed by Sutrue, the structurally superior parts were printed by our team before Sutrue assembled them into numerous medical prototypes – sometimes straight from our printer with minimal post processing. This in turn saved considerable time and cost and has resulted in the completion of a series of fully-functioning medical prototypes. Sutrue’s success in having achieved this is a fantastic example of what is possible with our DMLM machines and additive manufacturing technology. We are delighted that both devices are now mechanically sound and are ready for testing within medical industry,” (Zeidler continued).